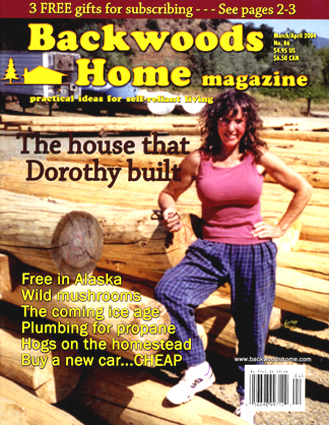 The March/April 2004 issue of Backwoods Home magazine came out with me on the cover and my house-building story inside. I was happy to have the opportunity to share my story and inspire other people to build their own houses and I was thrilled that it was the cover story! Then the first email came in. It was from a man who asked, "Are they real?" (referring to certain female physical anomalies). Dave at BWH asked whether I wanted to answer it or ignore it. Because I always look for the humor in any situation, my first reaction was to banter. I immediately thought of a few light-hearted retorts and fired them off to Dave to choose from, a not-so-funny one being just the word genetics. The guy's tactless question didn't really bother me. I'm basically good-natured, I love being a woman, and I give people the benefit of the doubt. I assumed this curious guy was just trying to be funny with his one-liner, and he let his biology override good taste. Maybe he's had a lot of disappointments in his life over things not being what they seem (who hasn't? ), and he's cynical. Who knows? We could speculate all day. I'm not excusing him, but in spite of all the cultural pressures to be politically correct these days, sometimes a man is a man is a man, and even a nice guy can forget his manners. I was a waitress for 40 years. I learned to laugh off almost everything and to give people enough rope to hang themselves, which they always did. But later on, and being the philosophical type, I got to thinking a little deeper about it: What if this guy had busted his behind developing a piece of property over a 22-year period, had built a house the hard way and it burned down, and his smiling photo was on the cover of a magazine...all happy because he now had his new logs to start rebuilding with...and the only question I would have for him (after zeroing in on the bulge in his pants) would be: "Is that real, or do you have a penile implant?" (Sorry to have to get graphic here to make my analogy.) No one should be reduced to two mammary glands or a penie winkle, even in humor, so I decided not to honor his question with an answer. So now I was inspired to elaborate on this very important social, cultural, and philosophical subject, but not in a man-bashing way. I have a son. I have brothers. I love men, and I really believe they have a hard time proving themselves in this society. I have great compassion, especially for men who struggle with their egos to the point of having to put women down to feel better about themselves. It's very sad. Nobody (man or woman) should have to stay stuck in "their place". Life is all about growth and change and evolving over time. The best relationships are solid friendships where both partners are acknowledged, accepted, and encouraged to develop to their fullest potential, and they applaud each other every step of the way. Unfortunately, too many relationships are not balanced, and both parties lose. One person tries to control the other, and it doesn't last. Givers and takers attract each other like magnets, but that doesn't last. The best combination is two givers trying to out-give each other! My point is that two people working together in an atmosphere of mutual admiration, respect, and cooperation can work miracles. It's the only healthy relationship to have. I found that out the hard way myself. I was raised in the 1950's generation that did not regard women as equals, and I was conditioned by my upbringing to dutifully accept my subservient role as wife, mother, and also full-time waitress...for 10 years of a one-sided marriage. I finally broke free and started the new life that I actually wanted. It was no accident that I was attracted to a younger man, Kirt, (from this generation) who automatically believed women were equals. It helped that his parents were good examples of equality too. Our age difference did not define our relationship; our common values did. We both blossomed. In summary, a guy who has reached the level of maturity to see the whole woman, not just her body parts, is in for a friend, a partner, and a helpmate for life. Why not have it all? I would advise the curious guy not to judge a magazine by its cover! Just when was I finished dealing with the curious guy, an email came in and gave me the shock of my life! I learned that a woman representing the feminist movement was actually offended by the cover photo! She contended that it was a blatant example of sexual exploitation used to sell magazines, and how could I have allowed that photo to be used? She implied that using that photo set the feminist movement back a few notches. My first and immediate response was emotional and defensive: "Hey, gals, that's just me...in my work clothes! It's summer; I'm sweltering hot and I'm in a t-shirt. So what? Everybody wears t-shirts, or less, in 100-degree heat!" Then I got to thinking again (a dangerous pastime). I came to the conclusion that, if I were flat-chested, I'm absolutely positive that not a word would have been said about the cover photo. The photo would have been OK if I were flat-chested, so size alone is the issue here. Because size is the only issue, I'm being discriminated against for a physical characteristic, so I should be the one offended! Women who take offense at something as illogical as this are the very ones setting the feminist movement back to chest-binding or to wearing burkas! They are the repressors and oppressors. Dave had seized the opportunity to run this inspirational story about a woman who is a combination of femininity and competence, and he chose the cover photo to celebrate a woman, not exploit a woman! He thought that, if anything, the article would portray a step forward for women. He is a wonderful example of the new-man era and sincerely acknowledges the tremendous contributions that women make right alongside men (sometimes hand in hand)! Dave and his wife Ilene are shining examples of that kind of partnership. When somebody protests too much, a red flag goes up. I ask, "What are they afraid of?" Why are they threatened?" Something is wrong with this picture, and I don't mean my photo. The person on the cover and the person in the story are one and the same...and they are both authentic. It's not a model on the cover, misrepresenting the contents inside. I challenge these women, with their not-so-hidden agenda, to be honest about where their outrage is coming from. It's time to check their premises, because they're not making sense. There's a big credibility gap here...and a double standard (the very thing they've been fighting against for years). These same women who scream at their boyfriends: "I want you to see the real me...the inside...not just my body", are just looking at my body and protesting! They couldn't get past being offended long enough to read the story inside! If they don't see this discrepancy, it's laughable. As hard as they try, they'll never be able to overpower biology and make everyone blind to outward appearances. That would surely result in de-evolution. Nature and the perpetuation of the species count on our making choices, and some of those choices are visual. Would I have to chaw tobaccy and strut around with my hands on my hips with an attitude like Aileen Wuornos in Monster to be an accepted image on the cover? I'm not a tough chick at all, but I managed to build a house, so the cover photo is accurate. I giggle, I cry, I whimper, and I whine, just like any girl. It hasn't been an easy life, but I don't have a chip on my shoulder, and the only axe I grind is the one I sharpen so I can split wood for my fireplace. I've never been the type of woman who premeditates exploiting what she can get from a man by using her feminine wiles. I don't believe in getting something for nothing. I want to pay my own way or trade value for value. I couldn't bear to feel beholden to anyone. I also don't expect somebody else to make me happy. I wouldn't put that impossible responsibility on a man. I have earned my own approval by actually achieving some of my goals, and I have no desire to flaunt myself. I have so many great hobbies, I could almost be a hermit. I've tried to pass on to my kids the universal values I've learned: Embrace the work ethic, earn your self-esteem by accomplishing good things, create your own reality by being true to yourself, love and nurture with all your heart and it will come back to you many fold, but never cast your pearls before swine! Amen! I took the time out to address the offended women because I hate injustice. I don't usually waste precious energy on people who have an agenda to unload on somebody else who has been minding her own business and getting things done, and who was attempting to share the experience with others for inspirational purposes. I refuse to be ashamed of my photo on the cover of Backwoods Home magazine! For better or for worse, it's me!